The Eastern Queens Greenway is incredibly lucky to have so many great volunteers who spend numerous hours of their free time making our streets a little safer for all of our neighbors. At this time of the year, we would like to recognize one of our volunteers who really went above and beyond. Joelle Galatan, one of our youngest members, worked with Bike New York and ELIJA to develop a learn-to-ride class for children who have autism. In the four sessions this year, dozens of children were taught how to ride a bike. The program Joelle started will give these kids a new form of outdoor exercise and a transportation option they can use for the rest of their lives. I would like to introduce everyone to Joelle Galatan, who is the daughter of Albert Galatan. Joelle’s love of cycling stems from her father, who has long been an avid cyclist. Joelle combined cycling with philanthropy, and began doing charity rides through her school when she was 12. She rode the Five Borough Bike Tour the past five years on behalf of ELIJA School, which teaches autistic children and is attended by her sister Talia. ELIJA school became an official charity partner of the Five Borough Tour this past year because of Joelle’s efforts. More recently, Joelle initiated a “Learn to Ride” program for autistic children through Bike NYC, teaching four sessions over the summer and fall of 2017 at Flushing Meadows Park. Due to the enthusiastic response – over 25 children were registered for the November 12 class – the program will continue in 2018. John Kelly, Albert Galatan and I all helped teach the classes that Joelle organized, and it was wonderful to see the expressions of happiness and pride on the children’s faces who learned to ride for the first time. Although many of them struggled initially, most were riding independently within one or two sessions. As a father of an autistic child, I am immensely grateful that there is someone like Joelle who takes an interest in special needs children to share with them the joy of cycling. And I feel honored to play an active role in the program. 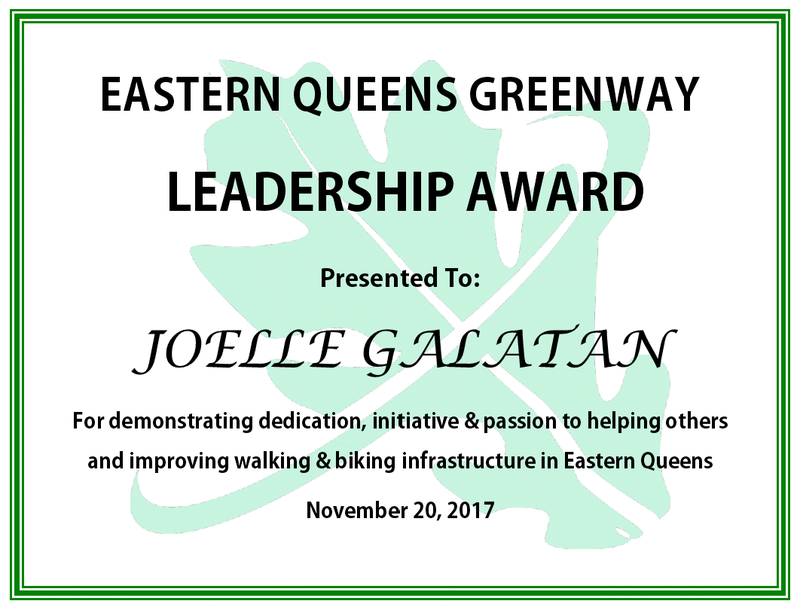 In recognition of these efforts, I am honored to present Joelle with the first ever “Eastern Queens Greenway Leadership Award.” Thank you, and keep up the great work, Joelle! Previous Post My First Day Biking to Work by Ilana Slaff, M.D.